It’s nice to feel like you have won something, and while there may not be anyone to give you a free puppy, free gasoline for a year, $1,000,000, free back massage or one of many other fabulous prizes for finding a slip of paper in an Easter egg. 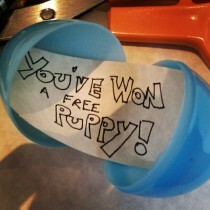 You never know perhaps someone will honor your Easter egg coupon and maybe those two baby kittens you’ve always wanted will become a reality. Have a happy Easter! If you happen to discover a fantastic egg around town today, you should try to hold on to that feeling of winning as long as you can. Previous Previous post: Stag Bikes Shirts!